This video explains why the gather is needed, what happens to the horses after they are gathered and a little about gathering them. The NAS(National Accademy of Science) Report thought the herd areas were often under counted. The 2009 count mentioned in this video may be a good example. Counting this many horses in these large areas is not a simple task. 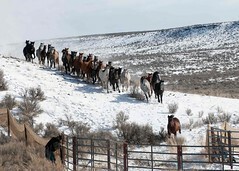 They are attempting to slow the growth rate of the Adobe Town herds vaccinating the mares with pzp and adjusting the stallion mare ratio to 60% stallions and 40% mares. This is an informative video.